If off the beaten track for your shopping, maybe you should add Sally Beauty to it. And to help motivate is this Sally Beauty Black Friday Sale Easel with special savings. 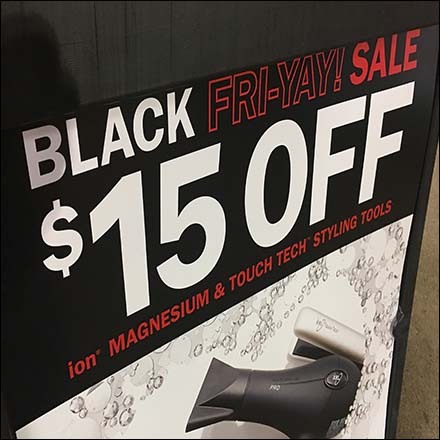 Yes in their more creative terms it is a Sally Beauty Black Fri-Yay Sale Easel … but Black Friday is probably not a good keyword for Google search to find this reporting. But reporting or not we found some great beauty items unavailable elsewhere, at a good price, with very professional advice. So give Sally Beauty a try and what foe the Easel A-Frame Sidewalk Sign for specials. For Sally Beauty Retail Fixtures posts by Title see..